We’ve covered a lot of ground since beginning the Digital Economist blog series. Here’s a quick recap of what we’ve discussed thus far. In part one, we provided a bird’s eye view of the four key pillars of a strong digital customer acquisition strategy. In part two, we ran through the building blocks of customer segmentation — underscoring the importance of knowing exactly who your most profitable customers are. And in part three, we explained how creating value propositions tailored precisely to your customer segments can serve as your most powerful tools for persuasion. All of that helped set the stage for what we’re about to do now: creating conversion journeys that inspire your most profitable customers to take meaningful action — the kind that will grow your business over time. Now that you know who your most profitable customers are and how you can motivate them to act, it’s time to architect a clear path that leads towards a purchase decision. This part of the process is important because as markets become increasingly saturated and competitive, digital acquisition costs ultimately rise. Optimizing how you convert your most profitable customers to take real and meaningful action is really the best way to keep costs down in the long-term. Here’s the challenge: there’s almost an unlimited number of journeys a customer can take to arrive at a specific endpoint. There’s equally an unlimited number of ways they can slip up, get distracted, or even get lost along the way. It’s up to you to create the path of least resistance. However, doing that requires optimizing your conversion journeys with precision. This is by no means a one-size-fits-all exercise. You need to optimize conversion for each of your customer segments and then track and measure performance by segment and by channel to more clearly understand LTV (lifetime value) and CAC (customer acquisition cost) at an individual level. Unfortunately, this is the hard part. Will you get it right on the first try? Maybe not. Good news for you, though, we’ve developed a three-step plan to help you get there. Let’s dive in. Drive Value and Action: Start by helping customers understand what they stand to gain by purchasing your product and service. Identify the need at hand (“problem statement”), then show how the product or service being offered will specifically address that need (“value proposition”). Then, follow it up quickly with a clear action step that allows them to take advantage of the offer (“call-to-action”). Make People Believe: Just because you say your products and services can address a specific need doesn’t necessarily mean that alone will convince potential customers to act. You need to backup your promise with proof points —the same proof points you came up with when you created your value propositions. These are the bits of persuasion that will get customers to believe that what you’re saying is verifiably true. Minimize Pain: If you still haven’t gotten a customer across the finish line, here’s your opportunity to make a hard (and more emotional) sell. Make the upside of taking action abundantly clear. Depending on the product or service you offer, appeal to people’s sense of patience (or lack thereof) and need for instant gratification, unwillingness to change, or general aversion to risk. Do they think that it’ll take too long to see results? Is there a potential loss of time or money involved? Help assuage their fears and apprehensions head on, and you’ll give them one less reasons to avoid taking action. Ask for feedback. Why make assumptions — regardless of how educated those guesses are — when you can solicit feedback directly from customers? Customer support chat on your website are actually a great way to get indirect feedback. Customers will usually start up a chat because they have an issue or concern to deal with. If you pay close attention to what happens during those conversations, you’ll likely uncover specific pain points or confusion around value propositions. This just requires you to do a little digging after each customer conversation. Now, if you want direct feedback, it’s simple enough to send customers online surveys on specific points. This basically turns your customer base into a living, breathing focus group. Measure what’s actually happening. The great thing about this digital world we live in is that we can essentially track every action along a customer’s journey in near granular detail. Make sure your web analytics tools are set up so that you can see and track where people are engaging the most and dropping off along the journey you’ve created. While you’re at it, be sure to take a close look at what you’re asking customers to do at each step of the way and what conversion is happening. 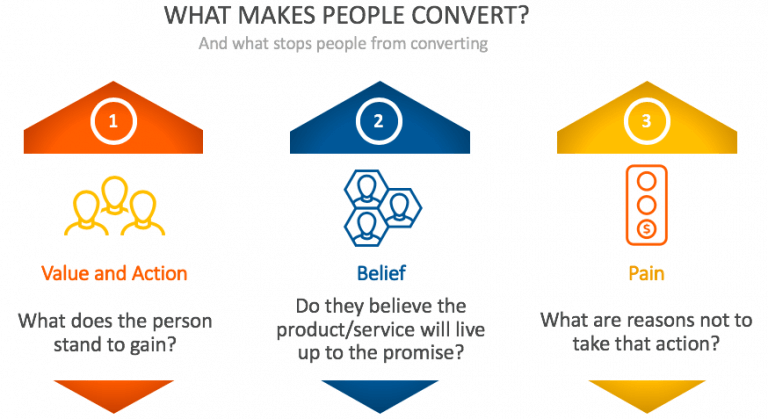 This can shed light into what customers need to believe in order to take action at each of those steps. You’ve got the data, so make good use of it. We wouldn’t be proper Digital Economists if we didn’t continuously test and measures our assumptions to refine our digital customer acquisition efforts at every step of the way. Building conversion journeys is no exception to this rule. So, based on the hypotheses you reach above — regardless of how you get there – you need to create, test, measure, and learn from a real-life digital scenarios. The easiest way to do this is by mocking up a user experience (UX) flow, identifying the points where it’s essential to communicate a clear value proposition and adding in the right call-to-action steps or qualifying opt-ins. Once you’ve laid out the flow, convert it to a branded user interface (UI) that you can code into a landing page. Then use your web analytics tools to help you measure the effectiveness of those test flows. And then start all over again with new hypotheses. The more you test, the more you’ll know. And the more you know about what works and what doesn’t, the more effective your conversion journeys will be. As you can see, creating effective conversion journeys requires a bit of trial and error. 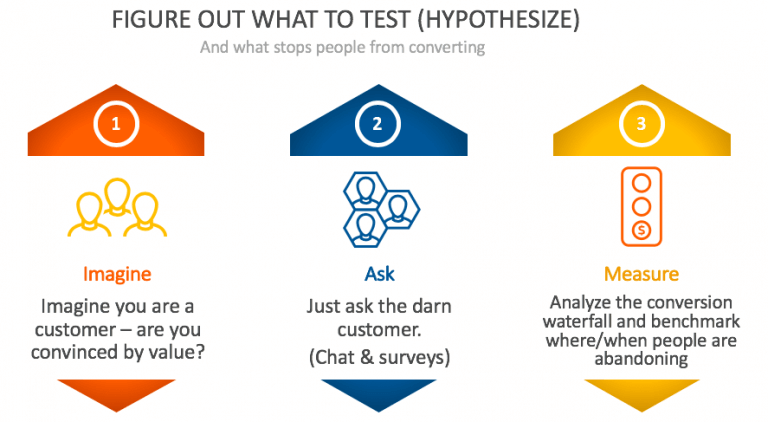 You won’t necessarily get it right the first time, but with patience and the right amount of testing and measuring, you will be able to turn your digital marketing efforts into a conversion machine. Want to learn more about how we help clients with their conversion journeys? Check out the NewHomeGuide.com case study and read more about how we helped them achieve 124% conversion rate improvement YoY.